Configure or update your schedule. Start with a blank schedule or use one of our managed base schedules. If you have multiple schedules, you can even base your schedules off of yours—perfect if you have a network feed with local programming overrides. 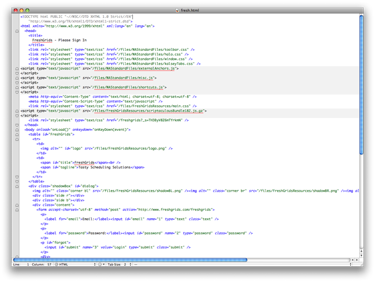 Set up your widgets you want to insert into your website. 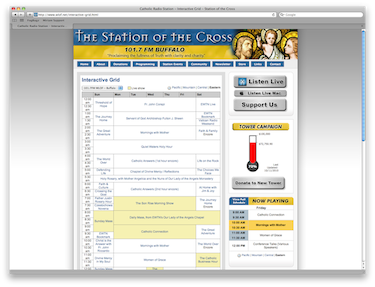 Chose from a Full Schedule, Mini Schedule, and Now Playing widgets. Mix and match to your heart's desire! They're all tied back to your schedule. When you need to make updates to your schedule, it's a snap! 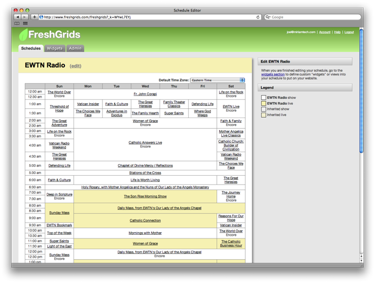 Log in to your FreshGrids account, update your schedule, and your widgets automatically update! No need to re-insert the code. If your schedule uses a managed base schedule, updates to that will automatically update yours! 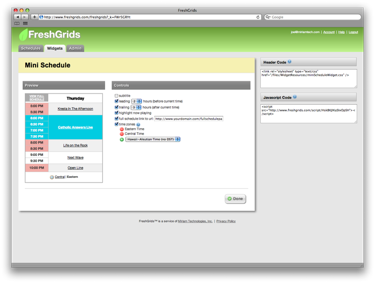 Try FreshGrids FREE for 30-days!